kR^iShNatvaM – fascinatorship, or toleratorship; kR^iShiH bhU vAchaka shabdo, ‘Na’ shcha nivR^iti vAchakaH; mAnuSheShu rajaH tamo guNa grasteShu, upekshaNIyeShu kR^iShNatvaM – so says smR^iti; because he tolerated certain notorious kings up to some extent, who have become so owing to the preponderance of rajo and tamo guNA-s in them, he is called kR^iShNa. This is what he is among humans. 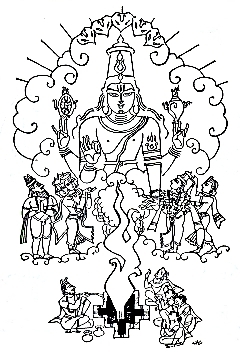 The following is a stuti-pATham on viShNu, and if any readers wish to learn it by heart like viShNu sahasranAmA-s, they are requested to refer to the text with undivided compunds - samAsAa yukta shlokA-s, given elesewhere on these webpages, and compare this with that for reading / learning facility. Otherwise muscical intonation will not be acieved with TIka-tAtparya shlokA-s, verses with broken compunds. In the text as shrI vR^ikShaM, viShNu it is read: 'he looked like the personified bliss in the form of all yielding tree...' but, this blisfull tree will not go well in the context of describing his weapons, or his fuming at demons, at present. Hence it is shra-vR^ikShaM; where shra - shrapanam – is boiling, roasting, baking etc- a fuming tree - ultimately. Thus, this is the forty-second chapter of first canto called harivamsha-parva, in harivamsha-purANa, the sequel of mahAbhArata, narrating the godhood of Vishnu.